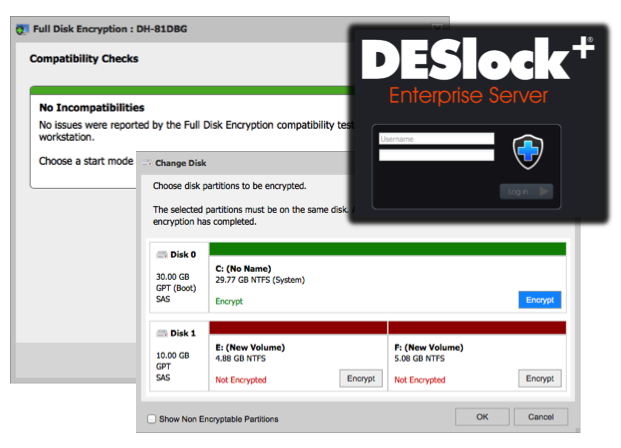 New Full Disk Encryption interface, provides support for encrypting UEFI systems using the new DESlock+ client. Improved compatibility checks including Safe Start mode. Possible compatibility issues are reported before Full Disk Encryption is started. Support for licensing and activating the DESlock+ Mobile app for iOS. Support for encryption and decryption of individual partitions and volumes. New interface to configure SSL for preinstall installations. The Enterprise Server is no longer supported on IE7 or earlier.